The CCWHC Quebec Regional Center, located at the Faculté de médecine vétérinaire of the Université de Montréal, was well represented at the Provincial Wildlife and Zoo Network annual meeting this past April. This informal meeting is hosted by MAPAQ (Ministère de l’Agriculture, des Pêcheries et de l’Alimentation du Québec) and MRNF (Ministère des Ressources Naturelles et de la Faune). It was designed for professionals with an interest in wildlife health to get a first hand account of recent news, trends, ongoing research projects or unusual diagnoses of diseases affecting wild animals in the province. Participants, who are also regular members of the Wildlife and Zoo network, will receive up to date information throughout the year regarding similar matters. This year, CCWHC staff presented a number of talks covering a wide array of projects/activities performed at the CCWHC – Québec Regional Center. 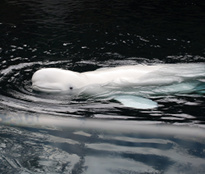 These included a summary of 2011 cases, difficult births in beluga whales, nematodes affecting the swimbladder of American eels, a summary of 2011 West Nile virus cases in birds, rabies surveillance, avian mass death associated with inclement weather and a review of common skin lesions seen in wild animals.